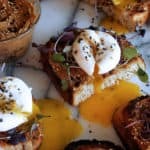 Miso butter toast with poached eggs. The miso butter is rich in flavor and a little goes a long way. 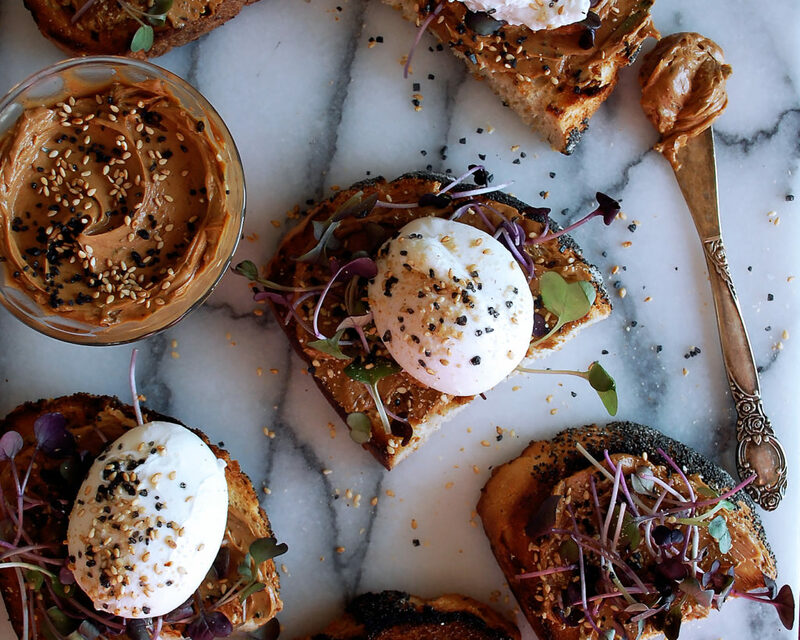 I’d like to think of it as a healthy-ish toast topping for when you just need something other than avocado toast. Lately I’ve been trying to think of really simple ways to add extra, interesting flavor to food. Miso is one of those ingredients that can always accomplish this mission. Miso is a fermented soybean paste that is traditionally used in Japanese cooking. But, you’ll see it pop up on restaurant menus in all different ways. My favorite being blended into softened butter to create the most amazing spread. It brings a unique, complex flavor that most ingredients just can’t provide. You can use the miso butter for this toast, and then save the rest to toss in noodles, sauté vegetables, or add extra flavor and richness to really anything you can possibly think of! Maybe slathered onto corn come late summer? YES. Blend the softened butter and red miso in a food processor until smooth. Add in the lime zest, lime juice, and tarragon leaves. Pulse again until incorporated. Fill a small saucepan with water and bring to a gentle simmer. Add in the white vinegar. Working in batches (I like to go one by one, but you could also do about 2-4 at a time), poach the eggs by creating a “vortex” in the water with a fork and gently cracking the egg right into the center. Maintain the water at a simmer while you poach the egg for about 4 minutes for a runny yolk. Use a slotted spoon to gently transfer the egg to a plate lined with paper towels. Season the egg with a pinch of salt. Repeat until all of the eggs have been poached. Meanwhile, heat a cast-iron skillet over medium heat. Add in a splash of oil, just enough to coat the bottom of the skillet. Toast the bread until golden and crisp on each side. 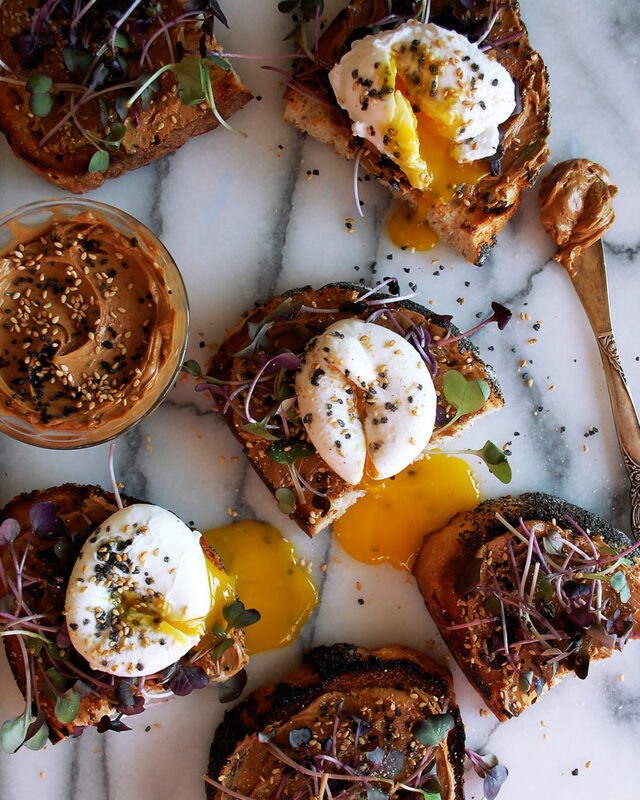 Spread the miso butter onto each piece of toast. 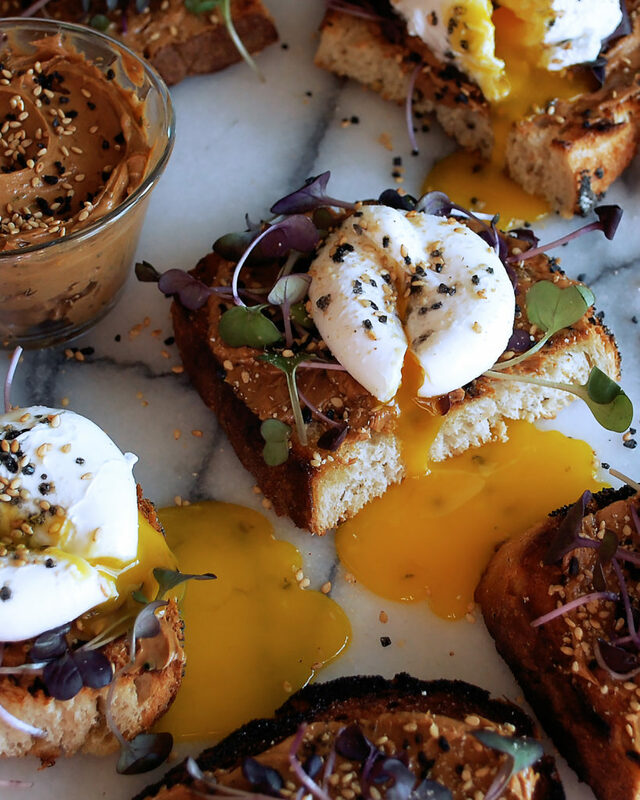 Top with the microgreens, poached eggs, and toasted sesame seeds.